Never in the history of the NFL has a franchise traded an eventual Hall-of-Famer and multiple Super Bowl Champion to replace him with a another future Hall-of-Famer and multiple Super Bowl Champion. That is exactly what the San Francisco 49ers did in the early 1990s when the quarterback reigns were handed from Joe Montana to Steve Young. Young, a product of Brigham Young University, initially struggled with his passing skills at college. But hard work eventually led to a record-setting NCAA career. 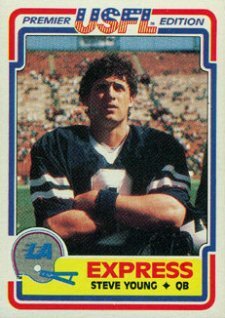 Young stunned analysts and fans when he opted out of the NFL Draft to sign with the L.A. Express of the rival USFL. When the league ceased operations not long after, Tampa Bay made him the first player selected in the 1984 NFL Supplemental Draft of USFL and CFL players. His NFL career started dreadfully with a 3-16 record over his first two seasons. At this point many labeled Young as a bust. When the Buccaneers selected Vinny Testaverde in the 1987 Draft, Young was traded to the 49ers to be the back-up and eventual replacement for Joe Montana. Playing for Bill Walsh, Young flourished. The legendary coach was proven right in his gamble of acquiring Young. Walsh believed Young's performance up until that point was more indicative of the fledgling Buccaneers organization than of Young himself. 1993 saw the first full season of Young at quarterback for San Francisco. He went on to have a remarkable seven-game streak, throwing 16 touchdowns with only two interceptions and a 122.2 passer rating. By the end of the year, Young set franchise records for most passing yards (4,023) and consecutive passes thrown without an interception (189). He also led the NFL in touchdown passes (29) and passer rating (101.5). Young became the cornerstone and face of the 49ers franchise, much like Montana before him. Young would go on to create a legacy of his own with the team. The seven-time Pro-Bowler was enshrined in the Professional Football Hall of Fame in 2005. This is the marquee card from the classic, tough-to-find set. The rather quick demise of the USFL initially deemed these cards worthless. 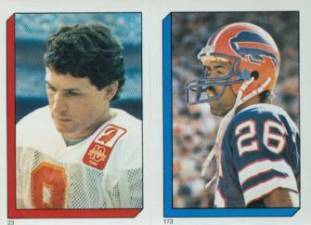 However, once you look at the other players on the checklist, which includes the first cards for Herschel Walker, Jim Kelly, Reggie White and more, it's easy to see why it eventually gained notoriety. The patriotic red, white, and blue design plays nicely with league logo, despite the plain layout and rather mundane uniform worn by Young. 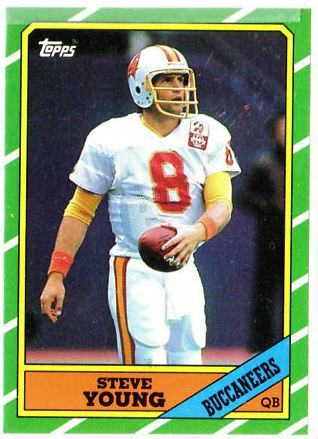 Although this is Young's first card, it is debatable whether it should be considered a rookie because it's licensed by the USFL and not the NFL. Ultimately, that's a choice the collector has to make for themselves, however we hold it in very high regard. An instantly recognizable year with the green and white striped border, this is Young's first official NFL card. Its value on the secondary market, particularly graded, mimics that of his first USFL card. As was popular in the era, Topps released a sticker album in 1986 and Young's is one of the more desirable singles in the set. Young shares the sticker backing with #173 Charles Romes. Was given a lot of collector cards… Looking to sell..